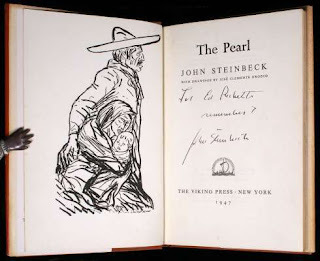 One novel that gets taught a lot is The Pearl by John Steinbeck. It's a very simple story about man vs. the establishment, and sadly, man does not win. On an essay yesterday, though, at least half a dozen kids explained to me that the protagonist, Kino, was a hero since he managed to save his family in the end. "But the baby dies," I told one kid. The kid was shocked. "But I read it twice, Mister." "I'm sorry to tell you, then, that you didn't understand it either time," I replied. Later on, a girl in another class told me the same thing. She not only read the book, but she saw the movie too, and in the end, the baby was still alive. "Then it was a terrible movie," I told her. Later, the girl told me that her former English teacher had read much of the book aloud to the class. When the teacher tired of doing this, she simply showed the film. It's so much easier than actually making kids read, I suppose. And then the girl explained that they never got to the end of the book. I'm not really happy with a teacher who presents half of an American classic and then opts for the movie version. It's particularly egregious since this movie, which I've neither seen nor heard of, apparently plops a Disney ending onto the story. It's even worse considering how very, very short the story is.